Please call 610.664.4517 for information about having your wedding at St. John’s. If you are looking at this section of our website, you are probably looking for a wedding venue. First, let me say congratulations! Second, let me invite you to come and see St. John’s. 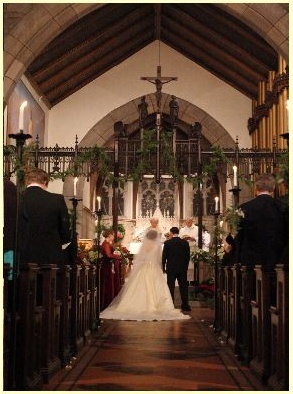 The church is truly beautiful and makes a great backdrop for any style of wedding ceremony. But a wedding at St. John’s is much more – it is a pastoral relationship which is based on two ideas. The first is that you don’t want to be married by a stranger, and I don’t want to marry strangers. Toward that end, I like to get to know those who will be married here. We will get to know a bit about each other, and we will talk about marriage and your wedding. Then we’ll meet a second time to walk through the ceremony so that you know what we do and why we do it. The second idea is that this is your wedding, not mine. There are certain things I must do, but beyond that I encourage you to bring your personal style to the ceremony. Congratulations to our gay and lesbian brothers and sisters on their legal victory for marriage equality in Pennsylvania! For those who do not have a church home, our clergy would be honored to perform your ceremony. If you are still interested, give me a call and let’s get together. In any case, whether or not you have your wedding at St. John’s, I wish you both a blessed and joy-filled life together.